It was a long drive yesterday but I finally made it to the mountains and met up with my son, Steven. I love mountains and taking trips when nothing is really planned except a basic idea of where to go and a general timeline. Just let things flow, I believe. The process never fails and this is why I drive so many miles and spend so much time traveling. Nature has a way of relaxing the mind and opening up the adventure neurons dulled by strip malls, traffic and the daily hustle. This trip is barely off the ground which is the best part. Anything is possible. This is day two of what turned out to be a 37 day / 9500 mile cross country road trip. 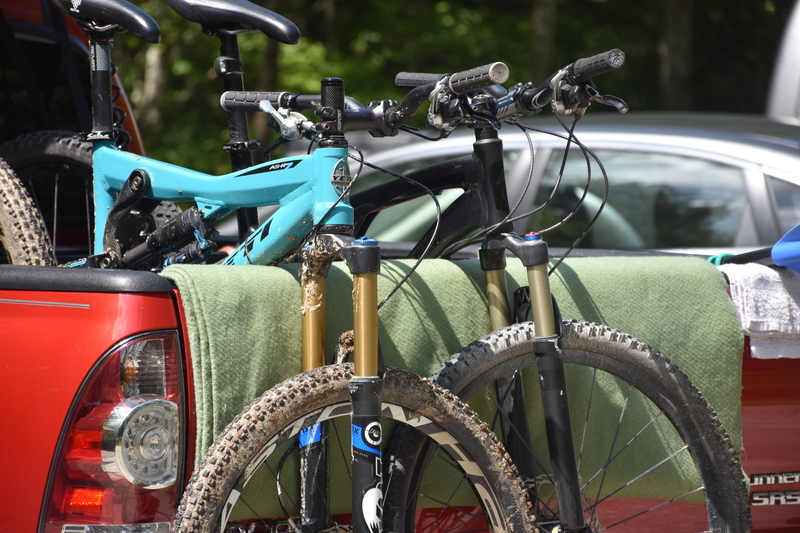 What better place to start than the Great Smoky Mountains camped near some of the east coast's best mountain bike trails. Tsali has great camping, a sweet lake nearby, world class kayaking and many miles of singletrack. For a more in depth description check out this site. It is a great start on a voyage to the west and I was soaking it in like a cool sunshower. I woke ready to ride. Steven was still sleeping so I headed out and decided to check out the right loop for a couple of hours before a trek to Bryson City. Mountain biking the Tsali trails is a great way to acclimate to longer climbs and fast downhill. In the beginning, I realized these trails do have several difficult climbs which brought back memories of prior visits. Difficult enough that I had to 'hike a bike' on a couple of the more rocky and winding steep climbs. It is well worth the effort and can't be beat if you want to jump start the day the best way possible. 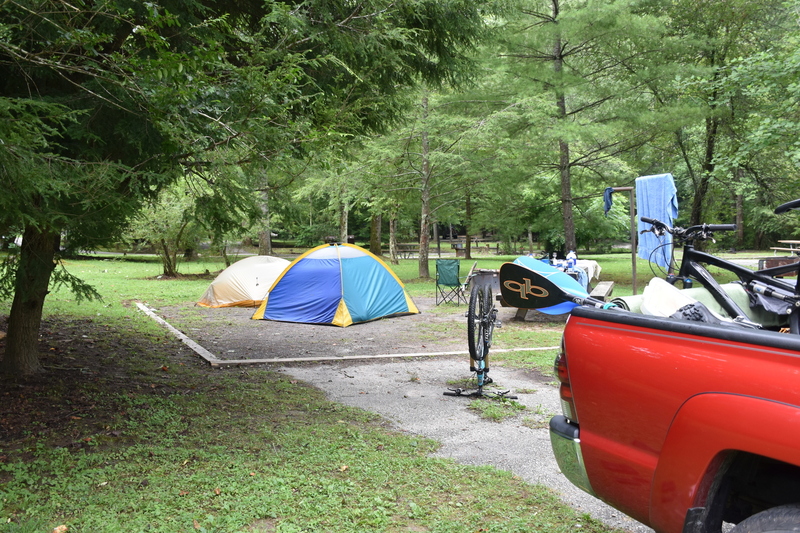 After the ride, I headed back to camp to dislodge Steven from his slumber and head out to Bryson City, NC. Bryson City is a cool little town tucked away in the Smokies with a surprisingly good mix of restaurants and a laid back retro country feel to it. We stopped for breakfast at the Iron Skillet and ordered up a couple of egg and cheese biscuits. One is plenty plenty because the portions are huge. While eating by the Tuckasegee River, we talked with a local man that happened to be having a beer for breakfast. Hey there is nothing wrong with a few beers by the river in the morning is there? It turns out he was a pretty cool guy and shared some important information about where to eat and what outdoor recreation would be worth checking out. One place was Deep Creek Falls close to town. We thought good enough. Let's go. 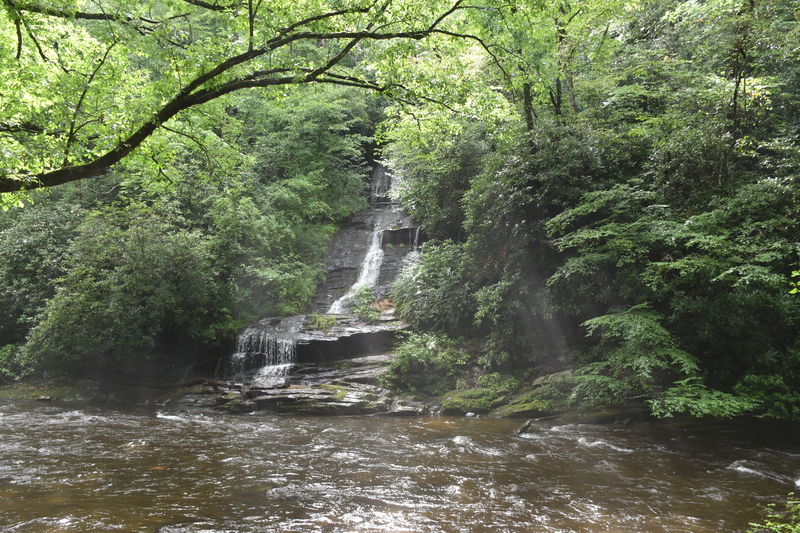 From the trail head, it is only a mile or so hike to the falls. Check this out if you are in the area. Next stop was the Nantahala Outdoor Center to see what was going on and have a few beers or whatever. Whenever I am in the area, I always stop here because it is like a mecca of outdoor activities especially known for the whitewater rafting and kayaking. One caveat is that the river flow is minimal when the Lake Nantahala Dam isn't releasing much water. In fact, there is a schedule which always seems odd if you think about it. One day there is a world class whitewater river and the next maybe not but it still is a sweet place to hang out for a while and there is a river schedule. Did I just write there is a river schedule? You know, if you want to kayak or raft when there will be flow. We drank a couple Fat Tires, had a dip in the cool, cleansing water and headed back towards Tsali campground. Fontana Lake is probably a mile from camp so we planned a little kayaking / paddleboarding excursion before descending in to camp and let the Nantahala river have its scheduled break. We loaded the kayak and paddleboard and went down to the Lake. Lake Fontana is beautiful and uncrowded on this section. We kayaked and paddleboarded for a few hours exploring some of the further coves before it got dark which ended the day in a excellent way.